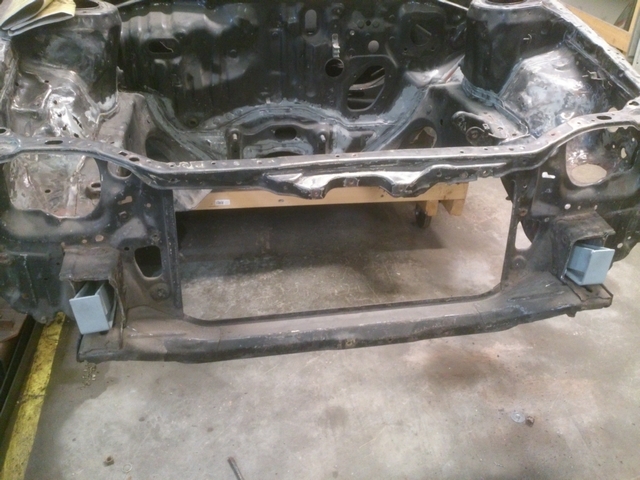 The body of the car needed a lot of work done to it. Like drilling out a whole lot of spot-welds and I needed to do a fair bit of welding. Any of you who have done work like that on a car know that it's a real pain in the *** to lay on you back under a car and have to grind and weld above you. And other jobs would become a whole lot easier and comfortable when I would be able to manipulate the position of the car. The best and easiest solution for this would be a rotisserie. These support and let you rotate the entire car. These are readily available and can be bought is several shapes and sizes. The downside of these are that they can be really pricey. They are not that complicated so I was already thinking up a design of my own. With a little steel and other parts I would be able to build one of my own at just a fraction of the costs. But while searching the internet for parts for a rotisserie, I came across a guy that was selling one for a price I couldn't match even by making one myself. So I decided to take a look at it. The rotisserie was a very simple design, but it was well designed and of very good quality with some laser cut parts and descent welds to it. My own design was a bit more elaborate than this with a lifting system incorporated into it so I wouldn't have to jack the body up to get it in. But for the price the guys was asking, it would save me the hassle of collecting parts and fabricating it myself and a whole lot of time. This would give me a few weeks head start I could spend on the car itself. So I bought it and took them home with me. 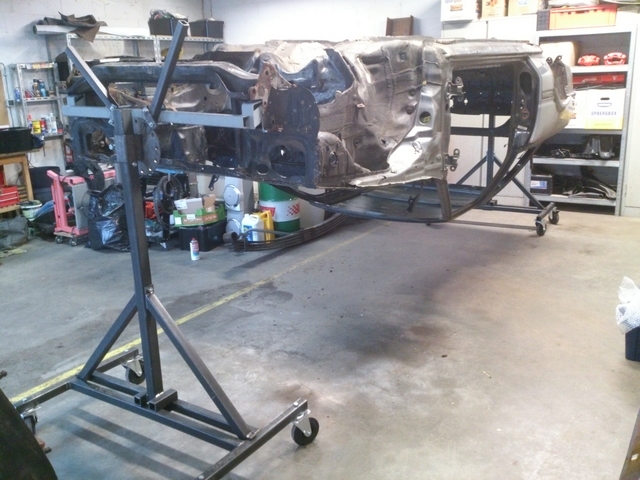 But to be able to hang the car from this rotisserie, I would need to fabricate something sturdy to attach the car to the cross beam of the rotisserie. The best way to do that with this car is at the bumper attachment points. 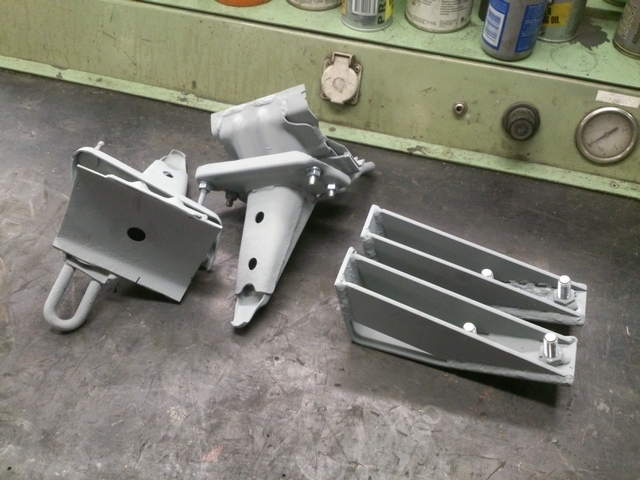 The brackets for the bumpers are bolted directly to the chassis beams, one of the strongest parts of the car. I could use the bumper brackets of the front bumper as an example. 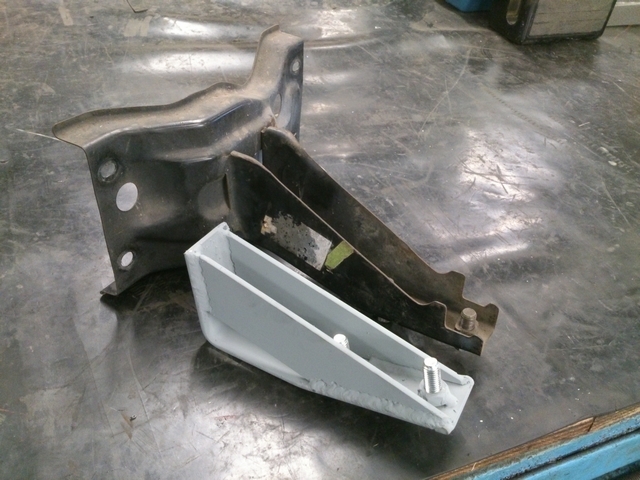 The brackets of the bumper themselves were made of pretty thin steel and wouldn't be strong enough. So I made my brackets a whole lot stronger to support the full weight of the car. I could weld these brackets to the cross beam of the rotisserie and bolt them to the car. 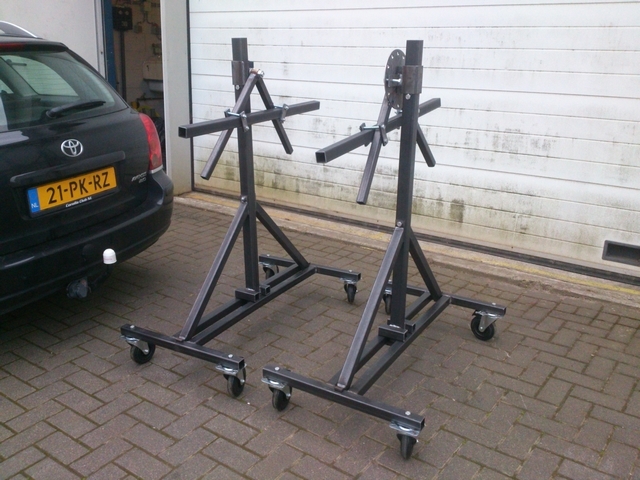 This should be sturdy enough to support the weight of the car in every position. 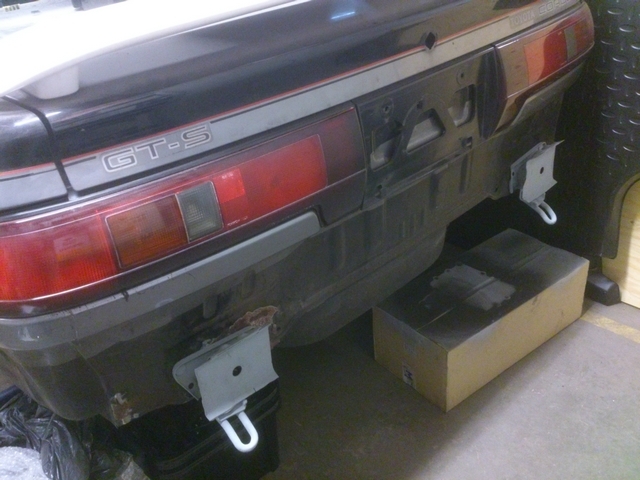 Now I needed to make support brackets for the rear of the car. But didn't have to make brackets for that myself, as I had a more simple solution for this. I wasn't going to use the USDM rear bumper anymore now that I had the much nicer JDM rear bumper. So I wouldn't need the crossbeam for that bumper anymore either. The mounting poinst of that crossbeam were already pretty strong and sturdy and should be able to take the weight as well. It would obviously fit the car and were easily adapted to what I wanted to do with them. 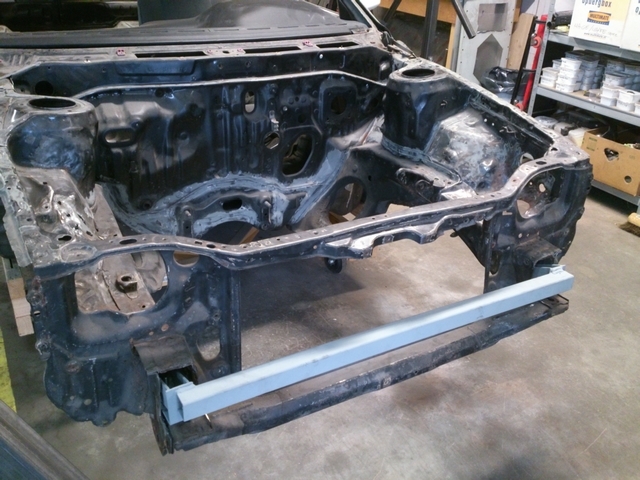 All I had to do was cut those mounting points out of the crossbeam of the bumper and weld them to the crossbeam of the rotisserie. And then there were 4 mounting brackets. All I needed to do was weld them to the crossbeams of the rotisserie. I didn't want to measure it all out, weld them in place and then find out that they wouldn't fit or that the bolts wouldn't thread through. 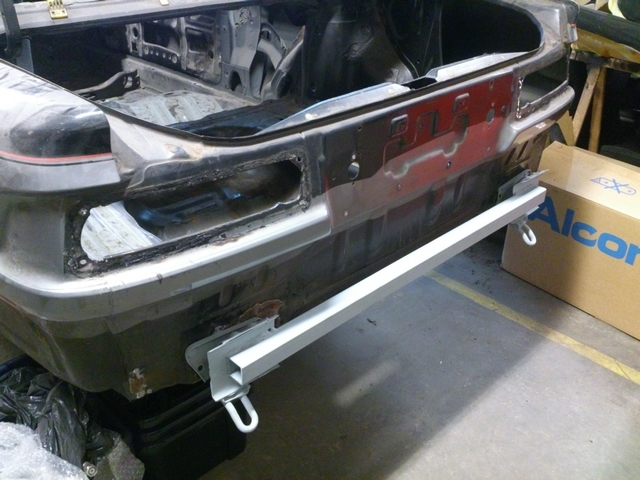 So it would be best to bolt the brackets to the car, make sure the crossbeam was in horizontal position and them tack them in place. 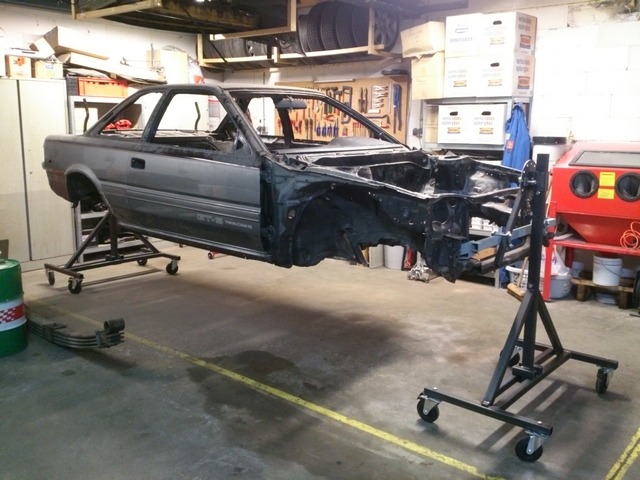 Now that the car could be bolted to the rotisserie stands, I could hang the car in place and try to find the center of gravity for the body. This was pretty important as that center of gravity should be roughly at the rotating point of the rotisserie to be able to turn the car over by hand. I had to lift the car up very high to be able to bolt it to the rotisserie. 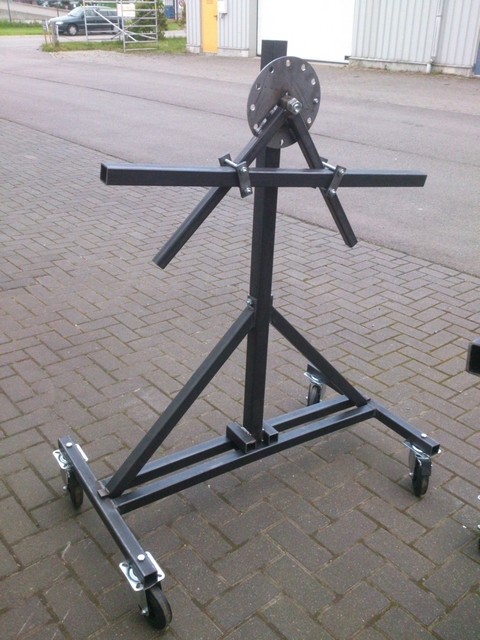 The crossbeam is clamped down with 4 plates so that it's adjustable. Once up in the air, I started looking for the center of gravity, of which I had no idea where that should be. In the picture above, you can see that the crossbeam is still very low on the triangular shaped frame. When looking at the pictures below, you might notice that the crossbeam is positioned a lot more toward the rotating pin of the rotisserie. That means that the center of gravity of the tripped out body of the car is surprising low. Almost down at the bumper mounting points! Not to bad of a starting point for good handling if you ask me. 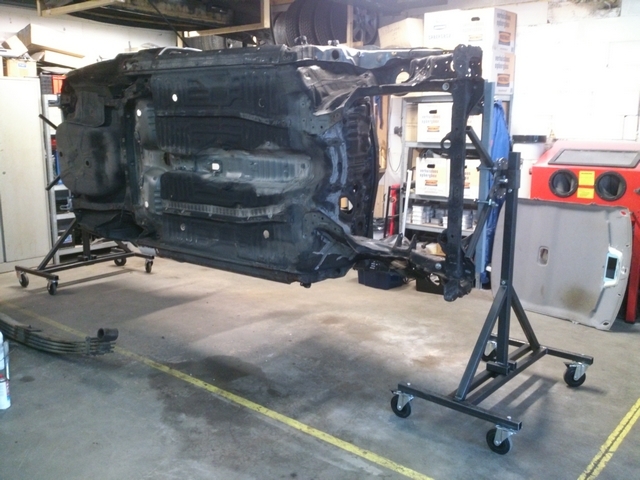 Now I was able to rotate the body of the car all the way round by hand. On one of the rotisserie stand there is a laser cut disc with holes in it. I can lock the position of the car in place by sliding a pin through one of the holes. This way I can work on the car without worrying about the car rotating further than I want. Working on the bottom of the car should be a breeze now. Probably one of the best tools I bought for this project up till now!